This is one of those shamelessly decadent recipes. I mean, as if a crumble wasn’t yummy enough, you make it even more delicious by making it a chocolate crumble. And a fruit filling? Nope, we’re going with a creamy caramel custard instead! 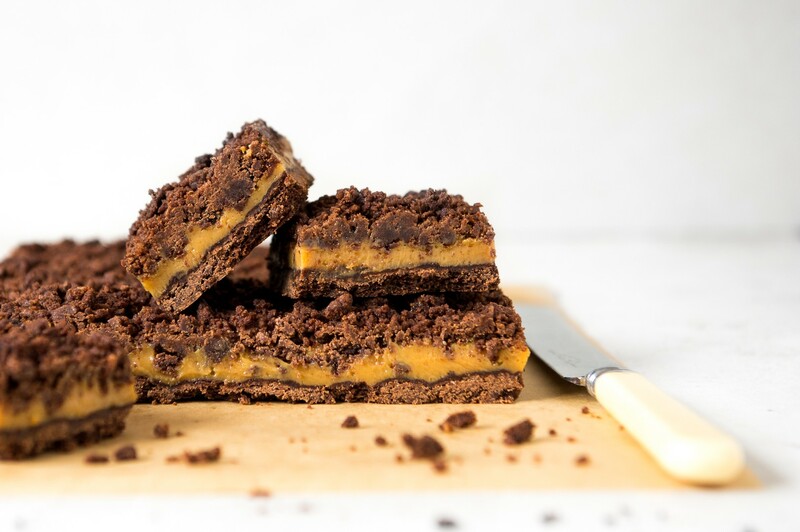 It’s no secret that chocolate and caramel are a match made in heaven. 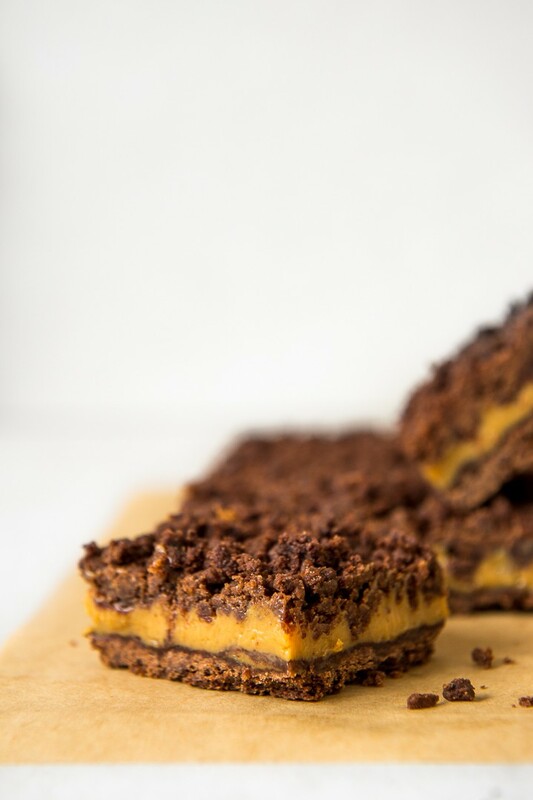 The combination of textures is what really makes these Chocolate and Caramel Crumble Squares a winner though. An ultra creamy, smooth caramel custard sandwiched between 2 layers of buttery, crumbly biscuit – is indeed as good as it sounds! Since the caramel filling is quite sweet, I added a fair bit of cocoa to the biscuit base and crumble to give it a dark chocolate flavour. Feel free to reduce it a little if preferred. Preheat the oven to 180°C. Grease a 20 x 30cm baking dish. Start by making the caramel custard. Place the condensed milk and butter into a saucepan and heat on low heat until the butter is melted, stirring frequently. Whisk in the Caramel Treat and increase the heat to medium. Bring the mixture to a boil, stirring constantly for 4-5 minutes until smooth and thick. Set aside to cool to room temperature. 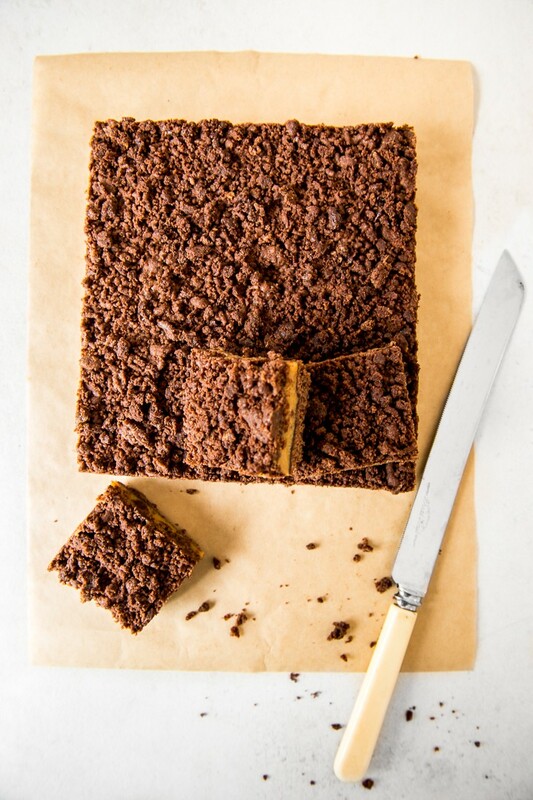 To make the biscuit base and crumble topping, stir together the flour, cocoa and sugar. Cut the butter into small cubes and use your fingers to rub the butter into the dry ingredients until you have a crumbly texture. Alternatively, use a food processor for this step. Stir in the vanilla essence. Press about half the mixture into your baking tin, covering the base evenly. Bake for 20 minutes. Keep the remaining biscuit mixture in the fridge. Once the caramel mixture has cooled, whisk in the egg. Spread the caramel custard over the biscuit base, then crumble over the remaining chocolate biscuit mixture. Bake for a further 20 minutes. Leave to cool completely in the tin, then refrigerate for an hour or two before slicing into squares.